Welcome to the rich and storied world of the Moulin Rouge in Montmartre, Paris. Welcome to the rich and storied world of the Moulin Rouge in Montmartre, Paris. Since 1889, this world-famous dinner revue has celebrated the essence of Parisian joie de vivre or "Joy for Life". Through the ages, artists of all kinds have been attracted to the vibrancy and vivacity of the Moulin Rouge. Henri de Toulouse-Lautrec found inspiration in the Cancan and the impertinence of La Belle Epoque or "The Beautiful Era" that was late 19th-Century Paris. During the 1920s, Mistinguett, the "Queen of the Dance Hall" played muse to the young sketcher Gesmar. Since then, artists have continued to produce hundreds of paintings, prints, posters, and drawings that capture life as a performer in one of the most iconic venues in the world. 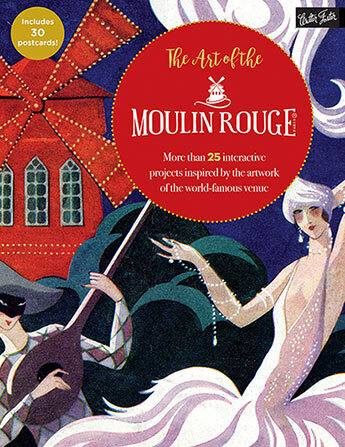 Fans of Toulouse-Lautrec and the Moulin Rouge will enjoy The Moulin Rouge Coloring & Activity Book. Filled with colouring pages, dot-to-dot puzzles, and colour-by-number templates based on the theatre's most famous posters and program art, colouring enthusiasts will enjoy adding their own unique spin to these legendary and symbolic works of post-impressionism. Following a brief introduction to colour theory and ideas for working in different colour mediums, present-day artists will embark on a creative journey through time to celebrate the lush lifestyles that epitomize Parisian culture as seen through the portals of the storied Moulin Rouge. Forty full-colour Moulin Rouge postcards are also included in this beautiful book.